Images of the golden age of wireless and family life before the age of television have widespread currency. Their dominance raises fundamental questions about the extent to which people’s memories of early radio and everyday pre-war life are shaped and mediated by these public histories. For geographical reasons radio has played an unusually important part in twentieth-century Australian life and culture. Australian radio must therefore stand as a major example in the study of the medium. 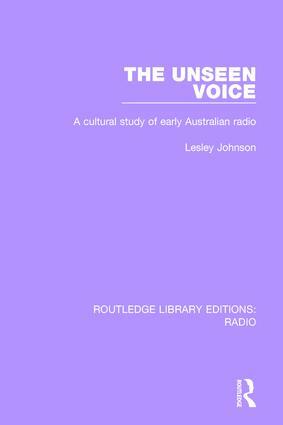 This book, first published in 1988, examines the early history of Australian radio, looking at the beginnings of radio itself and at the ways in which cultural tasks were determined for it. This is a detailed analysis of radio discourse and the construction of audiences, drawing on a range of theoretical material to examine questions about the production and dynamics of popular culture, the relationship between politics and everyday life, and the changes brought about in women’s lives.